First science results from the Methanol Multibeam Survey will be announced at the General Assembly of the International Astronomical Union in Prague, 14-25th August. In the first 26 days of observing at Parkes 377 methanol maser sources have been detected, including 150 new discoveries. 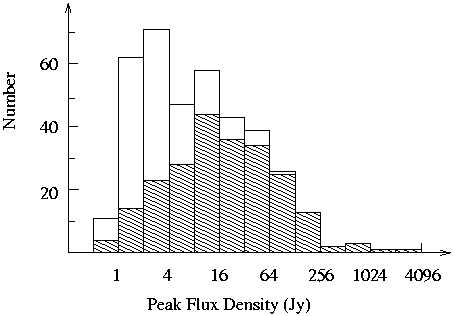 The new discoveries are typically ten times weaker than the previously known sources (shown hatched in the histogram). The survey has already achieved one of the major design goals, to detect star-forming regions on the far side of the Galaxy. The most distant object detected so far in the MMB survey lies over 60,000 light years away, in a region not previously known to be forming stars.